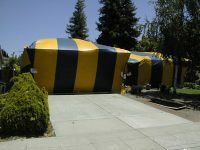 Looking for an Alternative to Fumigation to Treat Your Home in Redondo Beach, CA, for Termites? Fumigation is the most common type of termite treatment available and is often the only treatment that companies in Redondo Beach, California, offer. However, this termite control method is not without its drawbacks. Because it involves filling a home with toxic gas, it causes many homeowners to feel concerned about impacts on health. Plus, it forces homeowners to leave their homes for days at a time, which costs additional money and disrupts their daily routines. Instead of fumigating homes, Kilter uses the KILGUARD system to target infestations directly. Our treatment method is proven effective at eliminating subterranean and drywood termites and preventing them from returning. And, homeowners are happy to find that they won’t need to leave their homes during the treatment process. This is because KILGUARD does not involve noxious fumes or gasses and is non-toxic to humans and common pets. In fact, you won’t even need to worry about your plants or bag up your food and medications. Additionally, Kilter provides free termite inspections, so you can receive an honest report on your home without incurring any cost or obligation. And, if you choose to use our services, you can rest easy knowing we’ll effectively eliminate your infestation, as our treatment is backed by a two-year warranty. Contact Kilter Termite and Pest Control today to learn more about the benefits of choosing our services over fumigation. We’ll be happy to discuss our services and to schedule a free termite inspection at your home in Redondo Beach, CA.